The three books of the CD "Alcázar de cristal" are a new addition to Enrique Vargas's "The Great Flamenco Guitarists of Today Library" collection. - First, there is the wide palette of influences found in the work, from baroque to Spanish musical nationalism, and from jazz to nineteenth-century romanticism-all of which Rafael implements within an unmistakably flamenco musical idiom. Since there is practically no flamenco literature for more than one guitar, great effort has been made to include these arrangements in the transcriptions, which can be used in both professional settings and for didactic purposes. All the parts where there are more than one guitar have been transcribed in their entirety, making these scores ideal for duets or trios. This opens up some very interesting possibilities for professional flamenco groups or for students who prefer to play with another guitarist. For example, musicians who work in dance companies or who accompany singers can use various falsetas from this album that are arranged for more than one guitar. Flamenco guitar students can also interpret these pieces to learn to play with other musicians. This work includes a series of pieces that don't come from the world of pure flamenco, and therefore don't demand a deep knowledge of flamenco forms and techniques, which makes them accessible to guitarists of other styles-classical, jazz, Brazilian, etc.-interested in the flamenco guitar, making these pieces a sort of link between the flamenco guitar and other genres. 3. Compás , palmas and foot-tapping patterns, which, though indispensable for understanding flamenco rhythms, are rarely analyzed in publications about flamenco. 4. Analysis of the most difficult falseta s with explanations and suggestions on their technical execution. Since altogether this work is over 600 pages long, it is presented in three books in order to make it possible to use. 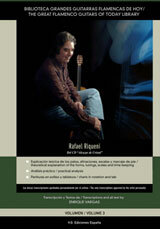 This is the habitual format for transcriptions in " The Great Flamenco Guitarists of Today Library" series: - "Algo que decir" by "el Viejín", - "Alcazar de Cristal" by Rafael Riqueni,, since contemporary flamenco pieces are much longer than they used to be in the past and often include more than one guitar. Enrique Vargas transcribes all the additional guitars, which obviously makes the musical text much longer. In addition, the commentaries, suggestions, and analysis sections make each book a mini-manual of flamenco in general, and the style of each artist in particular.  The tangos "Vivencias", recorded for three guitars but adaptable for a solo or duet. In the "Commentary and suggestions" section the key of F#Hijaz ( por taranta) is explained, along with the characteristics of modern tangos and the pattern for " tangos arrumbaos ." The accompaniment to the cante , which is arranged for two guitars, is transcribed in its entirety.  Thesoleá "Calle Fabié". This very long soleá , which lasts more than nine minutes, is a masterly review of the art of composing in this palo , which is undoubtedly Rafael Riqueni's strongest. The last part of this piece goes to the lighter rhythm of the soleá por bulerías and includes a second guitar track, transcribed in its entirety. There is also a string section chorus, arranged by Enrique Vargas for a third guitar, with harmonic passages and polyphonic movements that enrich the original melody.  The taranta "Alcázar de crystal" is a gorgeous guitar solo, a true gem in the repertory of any guitarist.  The rumba "Piel de toro". This guitar duet is a master class in playing por rumba , both for the lead and accompanying guitarists. The commentary offers extensive explanations on playing por rumba and various ways of executing the rhythmic pattern of this palo , which is very difficult to play with an authentic feel.  The alegrías "Tacita de plata". This piece, a work of true beauty, amazes the listener with its musicality, reminiscent of the style of the great maestro Sabicas.  The love song "Esta noche". This piece doesn't come from the flamenco environment, and therefore can be of special interest to musicians of other genres. It's made up of three parts: a flute and guitar intro, in which the flute part can be played by a second guitarist; a free-rhythm part two, in which the second guitar can arpeggiate ad-lib the chords written with chord symbols above the first guitar part; and a part three, in which the second guitar enters, and is transcribed in its entirety.  "Reflexión". This extremely short piece, which is just over a minute long, is a work of impressive emotional intensity reminiscent of the most beautiful passages of Turina or Debussy. 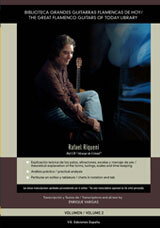 It can be of interest both to classical and flamenco guitarists.  "Puente, río, Macarena, Triana", an impressively eclectic sevillanas whose style, both in the orchestral arrangement and in the arrangement of the two guitars, calls to mind the style of the great Spanish composer Manuel de Falla. It includes a jazz-like improvisational part in which the piano accompaniment has been transcribed for the second guitar. This piece is a magnificent duet for two flamenco guitars. The "Commentaries" chapter provides an explanation of the structure of sevillanas . The "Analysis" section explains the improvised part, and suggests some scales that can be used during the improvisation. The concept of swing is also explained.  "Benamargosa". This fantasy is a magnificent mixture of Spanish impressionism and flamenco. The flamenco part is written to the compás por siguiriya and is explained in the "Analysis" chapter, along with a discussion of the rhythm of this palo and the way to write it according to Stravinsky's system. Enrique Vargas was the first person to write the siguiriya according to this more logical and concise system. The "Commentary and suggestions" chapter provides an explanation of the rondeña tuning used in this piece, along with chords and scales that help to better understand it.  "Rebelde," bulerías . This piece is a brilliant solo for flamenco guitar. The "Commentary and suggestions" section provides an extensive study of the evolution of the bulerías rhythm through the twentieth century, various rhythmic patterns for this palo , ways of writing it, and foot-tapping and palmas .